Pictured to (L-R standing) O-2 “Herbie 12″pilot Steve Davidson , cialis O-1 “Headhunter 37” pilot ILT Bob Brewster and UH-1H “Lucky 11” PIC WO David Groen,; (L-R kneeling) UH-1H Crewchief Mike Neely, no rx UH-1H Door Gunner Vasquez and UH-1H VNAF pilot Diem. 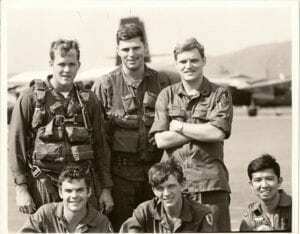 MAY 1971, while I was flying north of Qui Nhon, near the Phu Cat Mountains with an Air Force Fac O-2 flying high cover. I noticed a couple of individuals walking across an open area pot marked with large artillery craters. I made a low pass, about 20 feet over their heads and saw that they were carrying large packs. I made a second pass and the two individuals starting running separate directions. I picked out one of the two bad guys and on the next pass starting firing my 38 pistol out the window at him or her (did not know at the time. And, I only shot tracers – bad for the gun but good for me to see where the rounds were going). The O-2 fired a white phospherous rocket nearby. The one person I had isolated jumped in a large crate full of water and immediately sank out of sight. As I circled over head the bad guy came back to the surface but without the pack. The O-2 and I alternated making low passes. The O-2 pilot could not fire any personal weapons but the bad guy did not know that. In all of this I was making radio calls on open guard frequency to anyone in area that I had an enemy bad guy trapped in the open and asking if there was anyone willing to come pick him up. One UH-1 call sign”Lucky 11″ doing resupply missions answered me back that they were about 10 minutes away. I told them to come to my position and we would see if we could capture this one person. Both the O-2 and I stayed circling overhead where I continued firing off rounds from my 38 every so often just to keep the person in one place. The Huey arrived and after a conversation with the crew, it was decided that they would hover in over the crater and see if they could get the person to run. This would enable us to attempt a capture. After a couple minutes of circling the bad guy did not run but stayed in the water. At that point the Huey crew hovered low over his head and amazingly the Huey crew chief made a flying leap into the crater with the bad guy. The two wrestled and he was able to grab subdue him from behind. The Huey set down beside the crater and the crewchief dragged the bad guy to the aircraft where one two of the other crewmembers jumped out to help. As they held the bad guy, the crewchief went back to the crater where he retrieved the large pack that was underwater. The UH-1 then loaded the bad guy and his pack on to the Huey and held him on the short trip back to Qui Nhon where we all fly to and landed. Waiting for us were our MPs and Vietnamese MPs. Our MPS only watched as the RVN MPs grabbed our prisoner. We could immediately see that this was not going to be good for him. They left in a jeep. Later we would find out that during interrogation, our now POW would share information that he was part of a Sapper unit located in the Phu Cat Mountains. Members of this NVA unit had been harrasing and killing civilians around the Phu Cat area. Using the information from this individual, I helped coordinate an air strike and troop ground assault into the Phu Cat Mountains. We not only located the unit’s headquarters and routed the bad guys out into the open but we also discovered an underground hospital capable of performing full surgeries and recovery care. Interesting to this was the fact that much of the medicine and equipment was our own U.S. stuff, stolen from the 71st Evac Hospital in Qui Nhon. They were great guys and the one crewchief who jumped into the crater was not only very brave but, perhaps nuts in a good way. Just another day in the life of a Headhunter! If possible, The picture above shows myself with the Huey crew from 61st Assault Helicopter Company based at Lane Army Heliport. Unfortunately, I did not get everyone’s entire name on the Huey or even their unit but pictured from Back L-R, Steve Davidson, Air Force O-2 pilot based at Phu Cat AFB, myself with the 219th Aviation Company :headhunters”, CWO David Groen (61st AHC)), VNAF Co-pilot Diem, Crewchief Mike Neely and Door Gunner Vasquez (both 61st AHC).